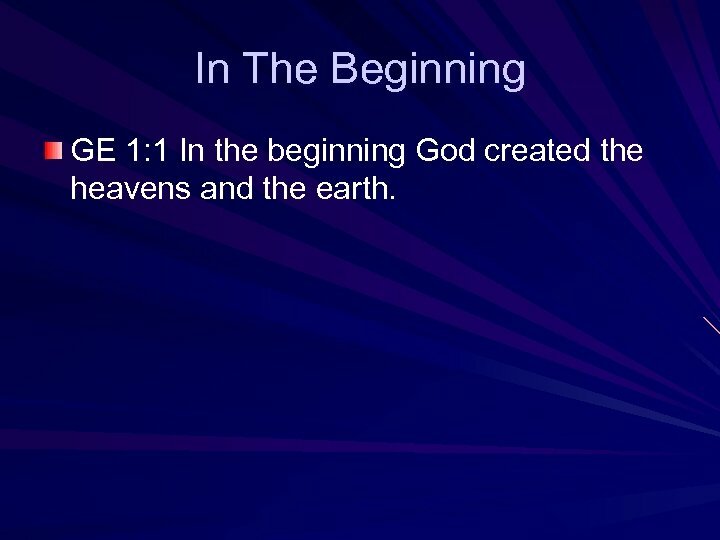 In The Beginning GE 1: 1 In the beginning God created the heavens and the earth. 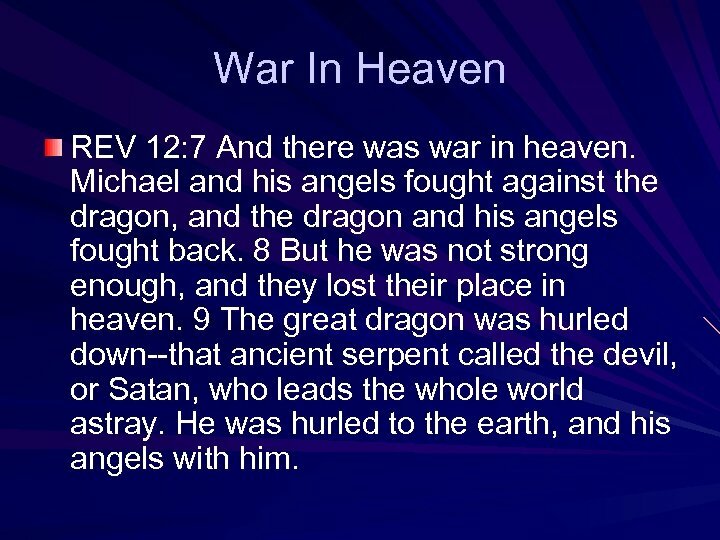 War In Heaven REV 12: 7 And there was war in heaven. Michael and his angels fought against the dragon, and the dragon and his angels fought back. 8 But he was not strong enough, and they lost their place in heaven. 9 The great dragon was hurled down--that ancient serpent called the devil, or Satan, who leads the whole world astray. He was hurled to the earth, and his angels with him. 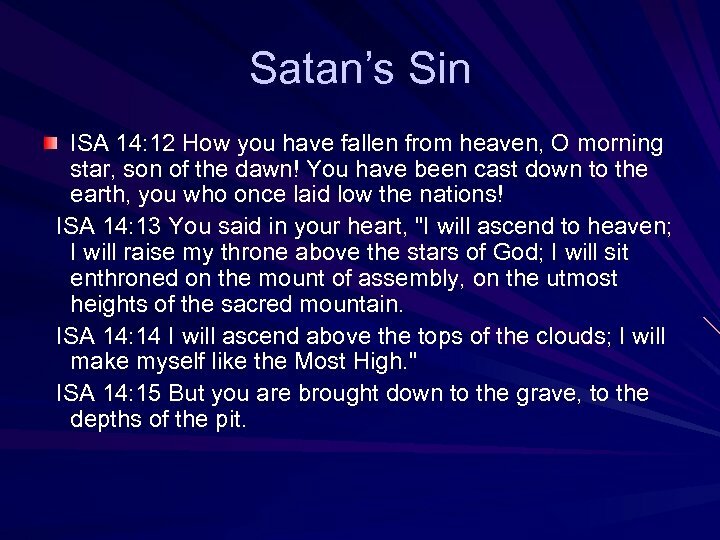 Satan’s Sin ISA 14: 12 How you have fallen from heaven, O morning star, son of the dawn! You have been cast down to the earth, you who once laid low the nations! ISA 14: 13 You said in your heart, "I will ascend to heaven; I will raise my throne above the stars of God; I will sit enthroned on the mount of assembly, on the utmost heights of the sacred mountain. ISA 14: 14 I will ascend above the tops of the clouds; I will make myself like the Most High. " ISA 14: 15 But you are brought down to the grave, to the depths of the pit. 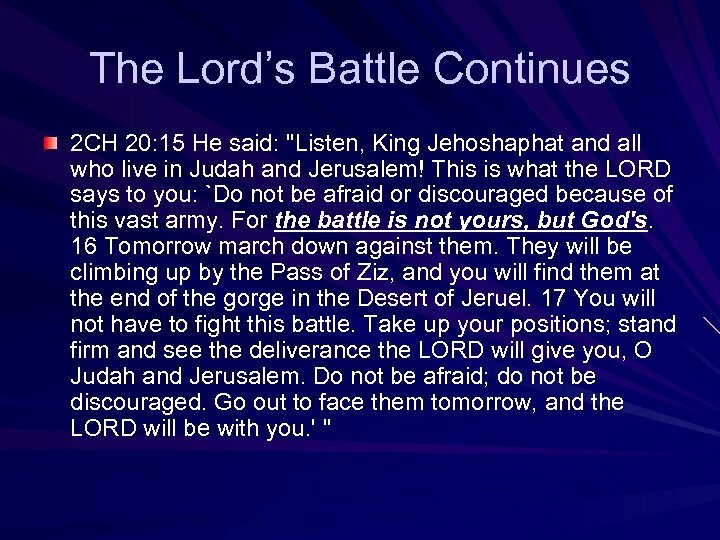 The Lord’s Battle Continues 2 CH 20: 15 He said: "Listen, King Jehoshaphat and all who live in Judah and Jerusalem! This is what the LORD says to you: `Do not be afraid or discouraged because of this vast army. For the battle is not yours, but God's. 16 Tomorrow march down against them. They will be climbing up by the Pass of Ziz, and you will find them at the end of the gorge in the Desert of Jeruel. 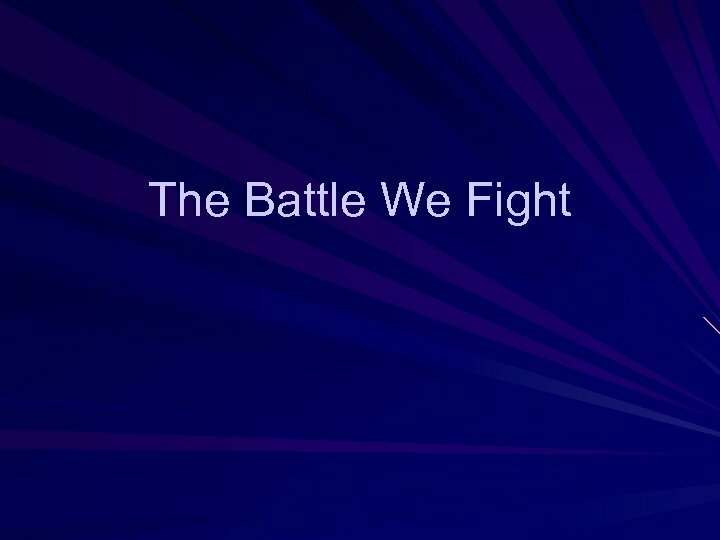 17 You will not have to fight this battle. Take up your positions; stand firm and see the deliverance the LORD will give you, O Judah and Jerusalem. Do not be afraid; do not be discouraged. Go out to face them tomorrow, and the LORD will be with you. ' 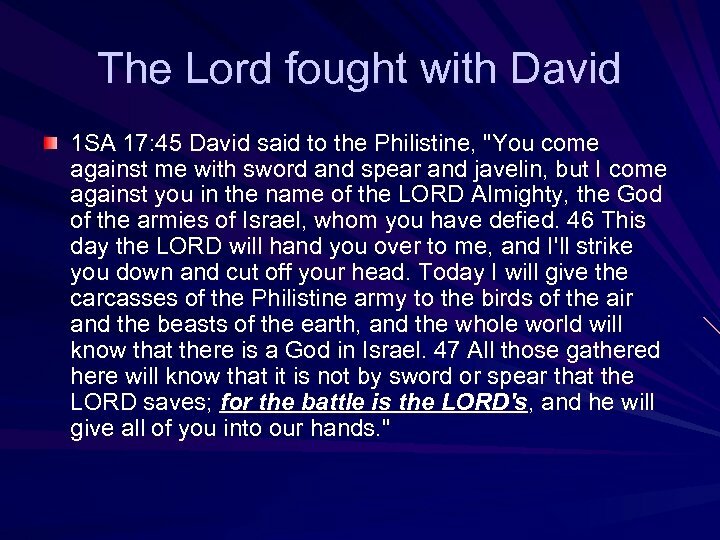 "
The Lord fought with David 1 SA 17: 45 David said to the Philistine, "You come against me with sword and spear and javelin, but I come against you in the name of the LORD Almighty, the God of the armies of Israel, whom you have defied. 46 This day the LORD will hand you over to me, and I'll strike you down and cut off your head. Today I will give the carcasses of the Philistine army to the birds of the air and the beasts of the earth, and the whole world will know that there is a God in Israel. 47 All those gathered here will know that it is not by sword or spear that the LORD saves; for the battle is the LORD's, and he will give all of you into our hands. " Elisha 2 KI 6: 13 "Go, find out where he is, " the king ordered, "so I can send men and capture him. " The report came back: "He is in Dothan. " 14 Then he sent horses and chariots and a strong force there. They went by night and surrounded the city. 15 When the servant of the man of God got up and went out early the next morning, an army with horses and chariots had surrounded the city. "Oh, my lord, what shall we do? " the servant asked. 16 "Don't be afraid, " the prophet answered. "Those who are with us are more than those who are with them. “ 17 And Elisha prayed, "O LORD, open his eyes so he may see. " 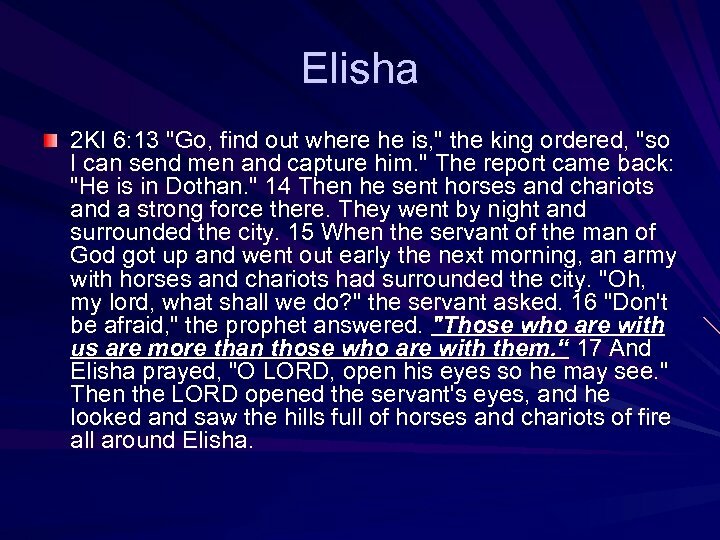 Then the LORD opened the servant's eyes, and he looked and saw the hills full of horses and chariots of fire all around Elisha. 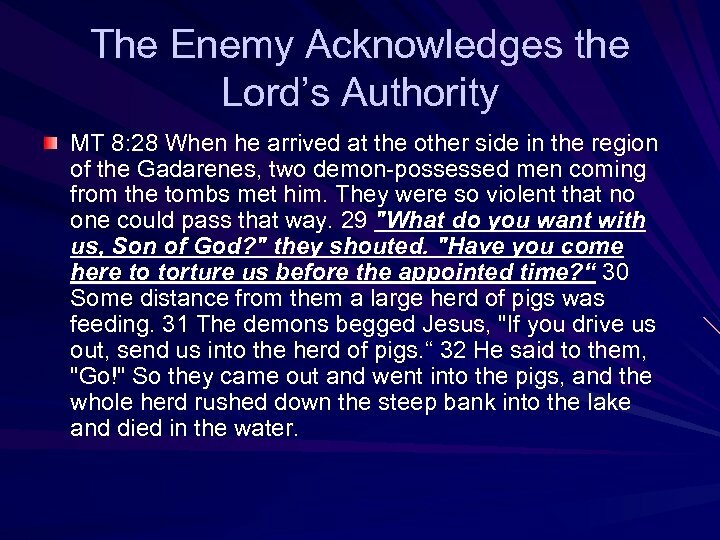 The Enemy Acknowledges the Lord’s Authority MT 8: 28 When he arrived at the other side in the region of the Gadarenes, two demon-possessed men coming from the tombs met him. They were so violent that no one could pass that way. 29 "What do you want with us, Son of God? " they shouted. "Have you come here to torture us before the appointed time? “ 30 Some distance from them a large herd of pigs was feeding. 31 The demons begged Jesus, "If you drive us out, send us into the herd of pigs. “ 32 He said to them, "Go!" So they came out and went into the pigs, and the whole herd rushed down the steep bank into the lake and died in the water. 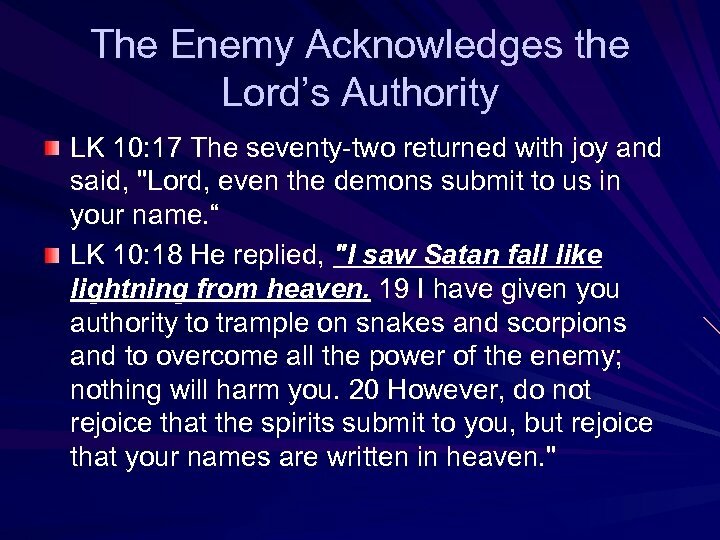 The Enemy Acknowledges the Lord’s Authority LK 10: 17 The seventy-two returned with joy and said, "Lord, even the demons submit to us in your name. 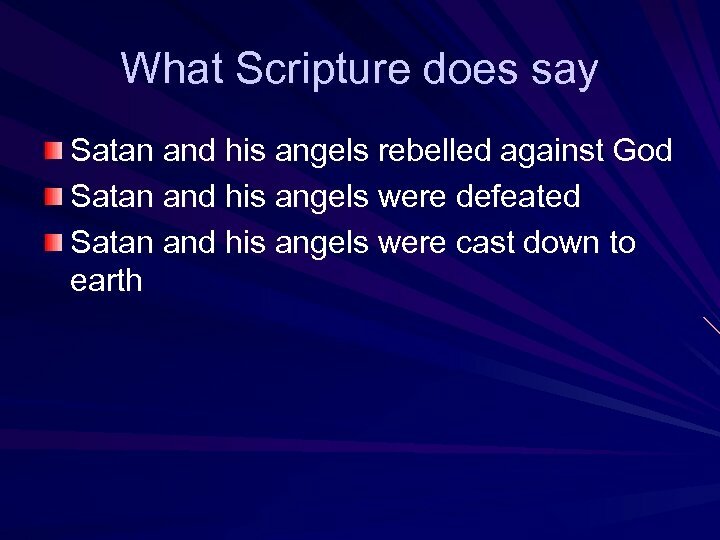 “ LK 10: 18 He replied, "I saw Satan fall like lightning from heaven. 19 I have given you authority to trample on snakes and scorpions and to overcome all the power of the enemy; nothing will harm you. 20 However, do not rejoice that the spirits submit to you, but rejoice that your names are written in heaven. " Our Place in the Battle EPH 6: 10 Finally, be strong in the Lord and in his mighty power. 11 Put on the full armor of God so that you can take your stand against the devil's schemes. 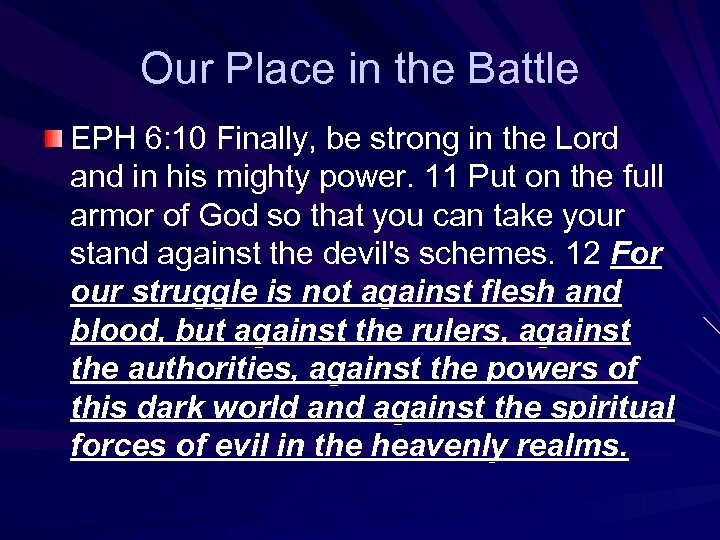 12 For our struggle is not against flesh and blood, but against the rulers, against the authorities, against the powers of this dark world and against the spiritual forces of evil in the heavenly realms. What do you make of this? The battle in Heaven is still going on. The battle is being fought on Earth. 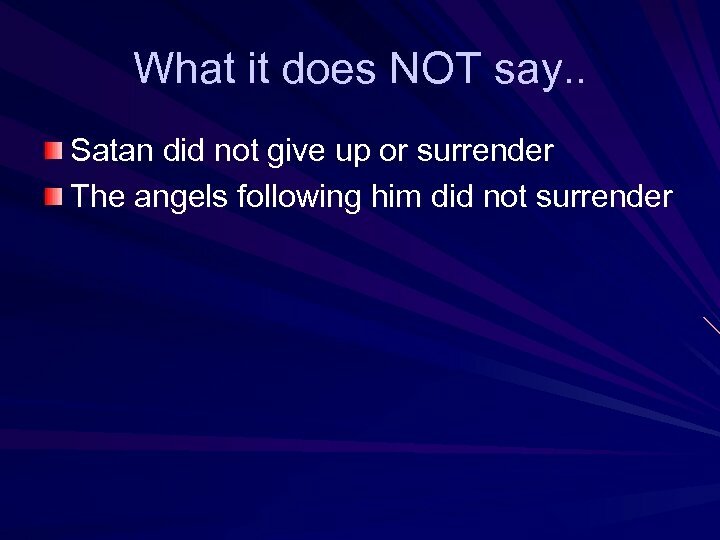 Satan is still doing whatever he can to tear down anything that exhausts God and establish power for himself. We fight in this battle every day. 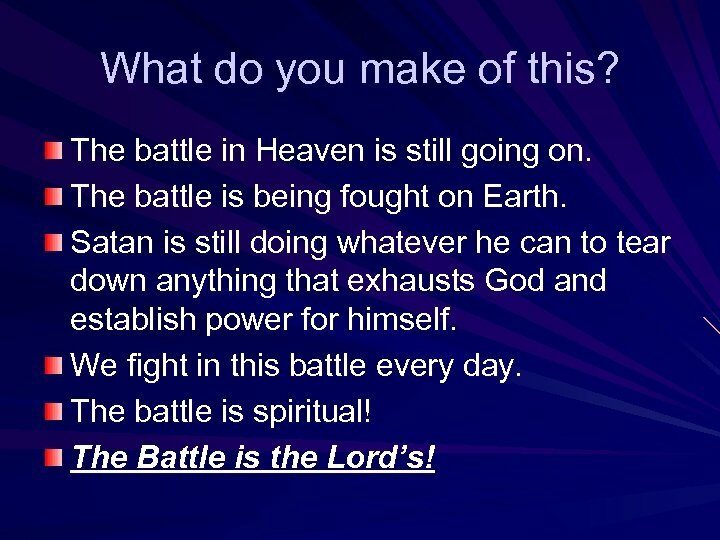 The battle is spiritual! The Battle is the Lord’s! What to do? Read the Word. 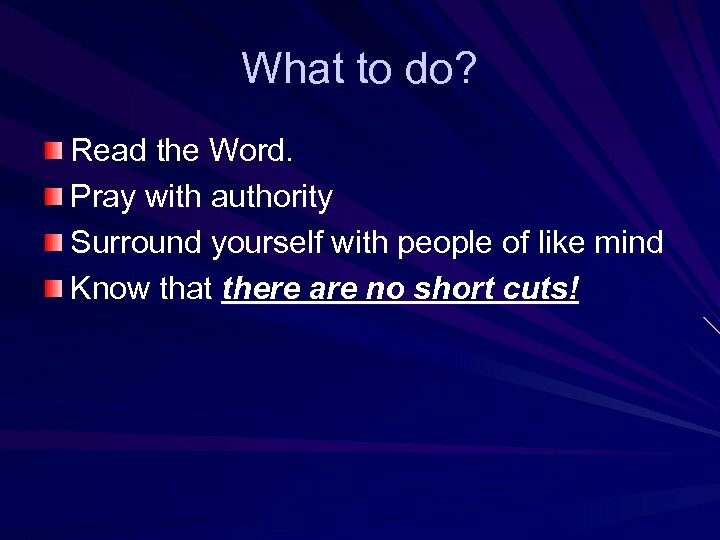 Pray with authority Surround yourself with people of like mind Know that there are no short cuts!